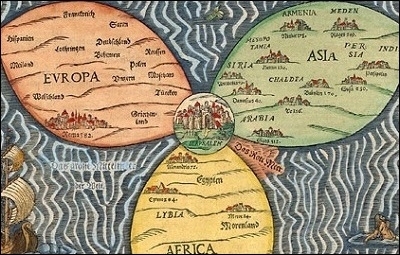 Jerusalem was often depicted as the center of the world in medieval European maps. Israel's control of a united Jerusalem is challenged now more than ever. U.N. Security Council Resolution 2334, adopted on December 23, 2016, declared the Jewish Quarter, the Western Wall, and the Temple Mount occupied territory and any Jewish presence there illegal if it is without Palestinian consent. This followed the October 2016 UNESCO resolution ignoring Jewish links to the Temple Mount. Moreover, U.S. Secretary of State John Kerry announced on December 28, 2016 that for the first time, the U.S. supports the idea that Jerusalem should be the capital of two peoples. Many Israelis console themselves that President Donald Trump will move the U.S. Embassy to Jerusalem, signaling a new era. Even if the move takes place, and even if it goes smoothly with few repercussions, it is not at all clear that the rest of the world will fall in step. 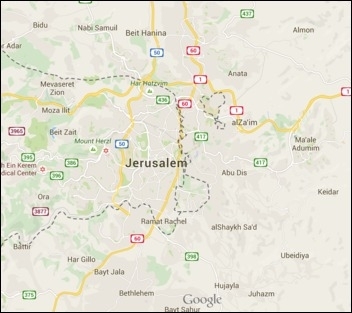 In all probability, most of the world will refuse to come along, despite the fact that west Jerusalem is not disputed territory. It will not help that there should be no legal or political problem moving an embassy to the western part of the city. There was great reluctance to move embassies to pre-1967 Jerusalem long before the Palestinians issued any demands for parts of the city. No particular sensitivity to the Palestinian issue was displayed during the 1948-67 period. Many foreign ministries simply do not want the Jews to have full control over the eternal city. The truth is that many foreign ministries have not yet put to rest the November 1947 U.N. resolution for the partition of Palestine, which includes an article to internationalize the city under U.N. control. They simply do not want the Jews to have full control over the eternal city, and are eager to help the Palestinians prevent such control. In the Christian and Muslim worlds, Jerusalem has great resonance, and we know the attitudes toward Jews in those cultures. These factors, together with diplomatic inertia (which certainly plays a role), explain the persistent international refusal to acknowledge that Jerusalem is the seat of government and the capital of the Jewish state. Jerusalem carries great symbolic value. There is no Zionism without Jerusalem, and David Ben-Gurion accordingly gave the city first priority during the 1948 War of Independence. The Palestinians understand this, which is one of the central reasons why they insist on claiming Jerusalem: They hope to water down Jewish attachment to the land of Israel. Jerusalem also carries great strategic value. Control of Jerusalem secures dominance of the only highway from the coast of the Mediterranean to the Jordan Valley, a route along which military forces can move with little interference from Arab communities. If Israel wants to maintain a defensible border in the east, it must secure the east-west axis from the coast to the Jordan Valley via an undivided Jerusalem. The military importance of Jerusalem, and Jerusalem's central role in Israel's eastern line of defense, cannot be overestimated – especially given the immense potential for political upheaval east of the Jordan River. The turmoil of the past few years in the Arab world suggests the need for great caution. Jerusalem is an issue that commands consensus in Israel. Maintaining social cohesion in the protracted conflict with the Palestinians is easier, not harder, if the struggle is for a united Jerusalem. Therefore, educational efforts should be directed towards reinforcing the national love for Jerusalem, in tandem with budgetary preferential treatment for the development of an even more thriving city. Israel's government should make this priority clear in its dealings with the new American administration. With that in mind, it should encourage the U.S. to overcome complaints and threats from the international community and move its embassy to Jerusalem. That would be an important step in securing Jerusalem for the Jewish people. Of course, most of the work remains to be done by the Israelis themselves. Fortunately, Jerusalem is in our hands, and we have a clear advantage in deciding its future. Battles are often won by taking over the center of gravity. Jerusalem is the center of gravity in the Israeli-Palestinian conflict in both a symbolic and a strategic sense. This insight must be internalized by Israeli society.